Throughout the world, we find landscapes that used to be dominated by smallholder farming. Despite great differences between such places, there are also many commonalities. For example, agriculture tends to be conducted for local use rather than for distant locations; many members of the local communities are engaged in farming; farming methods are relatively simple in technological terms (and happen without a lot of input of modern technologies or fossil fuels) — and people often have “enough”, but are not able to access or accumulate large quantities of economic wealth. Examples of such places exist around the world, and they share one more commonality: they are rapidly changing. How can rural landscapes in transition best be managed? Based on our work in Romania, I propose five common take-home messages for rural landscapes in transition. If we think about landscapes as a series of capital stocks, it becomes apparent quite quickly what the strengths and weaknesses of traditional farming landscapes might be. There is often little in terms of modern infrastructure (or physical capital), so that for example access to markets might be not very good; and agriculture might rely on large amount of human labour. Human capital then, is usually quite high when it comes to farming labour, but low when it comes to high levels of formal education. Financial capital is often lacking. Social capital is often quite high in traditional societies, but perhaps the most obvious capital stock is natural capital. Traditional farming landscapes are, often, very biodiverse. Some biodiversity may be lost when such landscapes become economically more prosperous, but at the same time, I would argue that natural capital provides a solid foundation for development, on top of which other capital stocks can be accumulated. If development focuses narrowly on just (for example) modern farming equipment and pumping investment into an area, it’s likely this would come at a high cost to natural (and quite possibly also social) capital. So, a wise choice, to my mind, is to be aware of what these landscapes already are rich in, and not destroy this in the process of trying to improve human well-being (assuming that this is the goal, rather than just profit, in which case it’s not sustainable development anyway!). A second, perhaps more speculative point is that many traditional rural landscapes use long-established methods to manage the natural environment. These methods typically go hand in hand with an understanding of what’s right and proper — certain activities ought to be done in certain seasons for example. Such traditional rules are typically upheld by informal institutions, together with a stewardship ethic of how one ought to look after the land. It follows that “modern” monetary incentives need to be used carefully. Pumping money into systems with a traditionally strong stewardship ethic can actually erode this ethic, thus accelerating environmental decline by destroying the value basis of sustainable practices. It somehow goes without saying — and was extremely obvious in our work in Romania — that not much good will come of “development” that is governed badly. When money disappears or nepotism is rife, environmental and social outcomes are unlikely to be very good. Just like the potential danger of monetary incentives is widely under-appreciated, there is only little understanding and interest in equity issues. As development takes place, differences in wealth between the rich and poor tend to be magnified in traditional farming landscapes. Who decides who gets to win and who misses out? Questions such as this, and questions around access to ecosystem services (and also government subsidies) are likely to arise. Unless they are managed well, they can lead to major disappointment and disillusions about development among local people. A lot of natural scientists like to recommend to decision-makers what they calculated to be optimal or efficient solutions. Well, fine. But what if there are no benevolent dictators interested in such information? I would argue that many of the world’s rural landscapes — and especially those in transition — are governed in complex or even messy ways, where it is not clear that anybody in particular is “in charge”; nor that anybody in particular is interested in guiding development in a way that is optimal or efficient from a sustainability perspective. In such cases, it’s important for scientists to be open to the idea that change will not come from the top down, through policy. Rather, I think there is value in engaging with local communities and providing information to people directly, so that nascent initiatives can work towards sustainability from the bottom up. These five points are a subjective list of observations from our work in Romania. They may or may not apply to other locations in the world. I’d be interested in people’s thoughts on the possible generality of some of these. What is the most effective way to conserve biodiversity? Much of the answer seems to depend on how we approach the problem – and which variables we believe can or cannot be altered. This little blog post is a call to more often jump between framings and assumptions about the future. The result, ideally, would be a resilient portfolio of conservation actions. This framing makes it quite clear that this particular set of authors simply doesn’t have much faith in protected areas. Basically, we stated that they only cover a small proportion of land – and an implicit assumption is that this is unlikely to change. In other words, our framing leads us to believe that protected areas are inherently limited. We do not believe that humanity would choose, collectively or otherwise, to set aside substantially more land than the (then current) level of 12%. At the other end of the spectrum, we’re experiencing a rise in people once again arguing for more protected areas – these are the scientists advocating re-wilding, or advocating land sparing. But interestingly, too, papers advocating more reserves also often start with specific framings that include implicit assumptions about humanity. Most common is the “Tilman statement” – that food production must double by 2050 to meet rising demand. Authors who take this as an unalterable fact do not believe that humanity – collectively or otherwise – will get its act together to improve food distribution issues, eat less meat, and waste less food. So, just like in the previous framing, some things are considered feasible, and hence worth studying (e.g. increasing the amount of reserves), while other things are considered not feasible and hence not worth studying (e.g. reducing the need to double agricultural production). As we jump between topics, we see that the perceived limits of human agency will again and again shape what a particular group of scientists believes we need to do. Depending in your assumptions, you will believe cities are the solution or you see them as the problem, you believe nuclear power is the solution or part of the problem, and technology in general is inherently problematic or might yet come to the rescue. Ironically, scientific papers are devoted to describing the specific analyses following such initial, largely implicit framings. And so, more often than not, analyses will confirm what a given set of scientists already believes in: the analyses by the pro-nuclear scientists will confirm the need for nuclear energy, while the analyses by the anti-nuclear scientists will, usually, show the exact opposite. Implicit framings cause many problems. Scientists do not come across as a united front, and as a result, science is not taken seriously by some decision makers – they pick and choose the science that most fits with their beliefs. Perhaps even more problematically, the existence of multiple truths that are contingent on framing, don’t sit easily with “objective” (positivist) natural scientists. Debates emerge, and technical details continue to be refined, when in fact misunderstandings arise from issues that are more hidden, as well as more important. Ultimately, none of us know which assumptions about the future, and the ability of humanity to get its act together, are most reasonable. Two possible solutions emerge. One, I would encourage scientists to try to check their own assumptions, and try to jump between different sets of worldviews. If somebody else arrives at the opposite conclusion, it’s most likely not because of different technical issues, but because of different a priori problem framings. The question then is, which bit of which framing is useful? Second, I think this points towards us needing a portfolio of solutions. The answer is not nuclear power, nor everyone living in the countryside, nor bigger reserves. And equally, the answer most likely is not renewable energy, living in cities, and using wildlife-friendly farming. It’s not doubling food supply, and it’s not everyone being vegetarian. Uncertainty suggests we ought to be somehow prepared for all of these options – make cities more sustainable where possible, but cherish sustainable life in the countryside where that is more feasible. Make nuclear power safe where it is needed, but use renewable energy where possible. Reduce our consumption patterns as much as possible, but know this is going to be hard, and so be prepared that this alone might not be enough. Somehow, this seems painfully obvious. Yet, disagreements on these very issues seem to be what many of us invest energy into – creating, again and again, polarized understandings in a multi-facetted world. The Landscape for People, Food and Nature Initiative fosters the integrated management of agricultural landscapes throughout the world. This is in line with parallel efforts (such as the European Landscape Convention) that emphasize that landscapes are a crucial component for the quality of life of local people and therefore require comprehensive protection, management and planning. However, many agricultural landscapes that have historically supported food production, nature conservation, and human livelihoods in ingenious and synergetic ways are rapidly disappearing. In the course of widespread agricultural industrialization, urbanization, and land abandonment, simplified and standardized land use practices are increasingly displacing traditional integrated systems such as extensively used mountain grasslands in the Black Forest of Germany, the traditional hay meadows of the Saxon region in Central Romania, and the dehesa agroforestry landscapes on the Iberian Peninsula. By this, we are not only losing quality of life for local people, but also traditional and localized ecological knowledge that may be needed for the upscaling of integrated landscape management. Agricultural landscapes are shaped by closely intertwined natural and human processes: a migrant shepherd crossing croplands in Rada de Haro, Central Spain. An international group of scholars coordinated through the Berlin-Brandenburg Academy of Sciences and Humanities (Germany) and the University of Freiburg (Germany) undertook a three-year effort to understand change of traditional agricultural landscapes through the lens of social-ecological resilience, an analytical approach that promises to systematically guide natural resources management under conditions of global environmental change. Drawing on numerous landscape-scale case studies from Europe, but also Africa, Australia and Latin America, they composed a recently published volume titled “Resilience and the Cultural Landscape: Understanding and Managing Change in Human-Shaped Environments”. It raises questions such as: How are traditional land use practices interrelated with resilience? How can low-input land use support adaptation to conditions of continuous and rapid change? How do collective efforts of social networks contribute to an integrated management of landscapes? By conceptualizing landscapes as social-ecological systems, the team shed light on critical landscape properties and components such as drivers of change, adaptive cycles, regime shifts, ecosystem stewardship and collaboration, coupling of social and ecological systems, and social capital. The group argues that previous landscape conservation efforts, particularly in Europe, have focused too much on static, isolated, and single sector strategies (mainly motivated by preservation of biodiversity and scenery). Emphasis on resilience and adaptation is essential for guiding integrated agricultural landscapes through current conditions of rapid environmental and societal change. Such resilience-based approach may help re-direct the decline of traditional agricultural landscapes into creative pathways and reveal ways in which functions fulfilled by “traditional” landscape elements may be integrated into “modern” land-use systems, for example into emerging energy cropping systems. For further information on the book, click here. So here’s a slightly emotional rant about things that we think are concerning about current developments in conservation biology and applied ecology. We think it’s important to take a step back and look at what’s happening in our discipline (and its context), rather than blindly run along with current developments. So, here’s the rant. If you strongly disagree, or strongly agree, or mildly (either way), feel free to comment. Our aim is not to attack any individuals – we strongly believe in multiple perspectives being needed BUT we also think that some perspectives dominating, and insisting on being superior, can be very dangerous. When discussion gets very heated, let’s keep in mind that we ultimately share similar goals, regarding “life on earth”! 1. There appears to be a divergence of how different groups of people tackle the same issues. The recent land sparing- land sharing debate beautifully mirrors this, but the trend is broader. There is agreement that the world is facing big challenges, regarding more than biodiversity conservation – including food, poverty, and so on. Two alternative approaches seem to emerge to deal with these challenges. The first approach, which we favour (as readers of this blog know, so no big news here), is to try to grapple with the incredible complexity of the world through an approach of social-ecological systems. This kind of approach is also used in the Satoyama Initiative, for example. The logic is that unless we understand the linkages between people and nature, and try to improve those linkages in the future, everything else will be short-term band-aids. The second approach is more difficult for us to write about because we are critical of it. But it still has its place. This is to seek firm, elegant solutions to complex problems. Green et al.’s model on land sparing falls in this category, and much of the evidence-based conservation movement also goes in this direction. This is about finding solutions, through better analysis, so that we have clearer facts, which in turn, end up leading to better decisions. The problem with the second approach is that it typically reduces away much of the complexity of the real world. Food production does not equal food security. Higher yields have essentially nothing to do with less hunger. More reserves failed in the past. It’s like we went through two decades of writing about matrix management for a complete back-flip … since the evidence base for conservation in agricultural landscapes is poor, let’s just go back to reserves. To us, this seems to be going backwards. But the more important thing is not what we think, but that there now is a big divergence emerging: while people like us try to say “we need to do better on social-ecological integration, since it’s not all working yet”, others seem to say “we need to give up on conservation outside protected areas”. If we are right, this is a true divergence in paradigms. And we think it’s reflected increasingly in more and more separate narratives that are played out in separate journals and research groups. Ecology & Society probably is a big no-no for many of the authors that are naturally inclined to go for optimization models. Paradoxically, this divergence doesn’t have to be this way – as one of us argued a little while back in Trends in Ecology and Evolution. But… to us it seems the gap between paradigms is widening not narrowing. 2. Selection pressure regarding research paradigms is different in different settings. If you live in Romania, and are confronted on a daily basis with poverty, biodiversity, and sustainable land use practices, you see the world differently than if you operate in systems where connections with nature have already been lost – in those cultures, modeling seems to hold all answers, and field data is often collected by volunteers. Recent implicit or explicit calls for “less field ecology” fail to notice that field data is what keeps us honest. It’s not about more data, it’s about sound intuition for social and ecological complexities. You don’t get intuition about real-world systems just behind computer screens. We need both analytical skills and field intuition: advocating one over the other is counter-productive. 4.Cognitive synthesis has lost against meta-analysis. The human brain is incredibly good at drawing on all kinds of signals to understand the world. Many relevant conservation problems happen in a space that requires those many different signals to be integrated – including people’s motivations, scientific data, institutional settings, and so on. Meta-analysis is now favoured by leading journals. But it reduces synthesis to statistics – when statistics should be a subset, not a replacement, of holistic synthesis. So what to do? We believe that we need a multitude of perspectives – but the divergence of narratives and research groups into extremes in either direction is unhelpful. And we need to recognize that although big journals like universal truths, most conservation issues are context-dependent. Those who go in the field and are interested in social-ecological complexities must see value in models and rigorous quantitative approaches – but equally, those interested in strictly quantitative approaches must know the conceptual boundaries of such approaches. 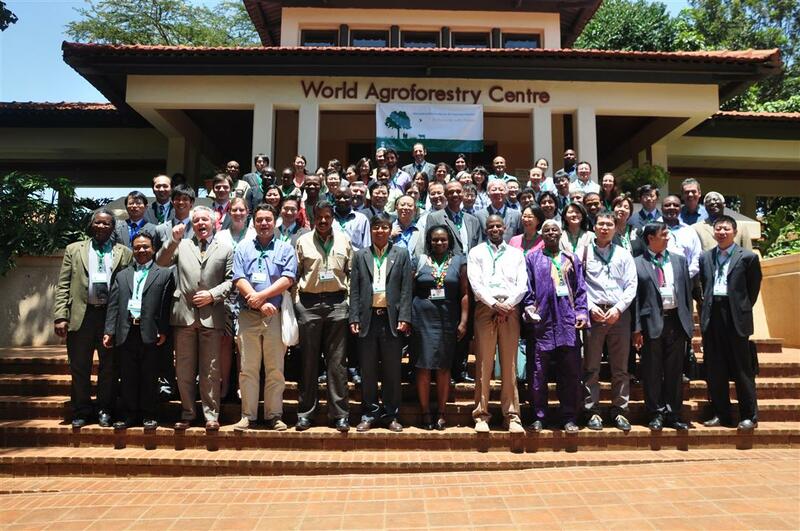 From March 12 to 13, 2012, the second meeting of the International Partnership for the Satoyama Initiative (IPSI-2) was held in Nairobi (Kenya). As one of the 117 members, we considered it relevant to attend the global conference. So I’d like to briefly summarize the event. But before I do so, it might be important to describe what Satoyama is actually about. The term stems from the combination of two Japanese words – sato (village) and yama (mountains, woodlands and grasslands). Satoyama describes traditional Japanese cultural landscapes that integrate human settlements, agricultural land (often used for wet rice cultivation or tea planting), and managed coppice forests along surrounding mountainsides. Due to the close dovetailing of both terrestrial and aquatic ecosystems, Satoyama landscapes are particular rich in biodiversity – not despite, but because of their human impact. Rising intensification or abandonment of land, rural migration, and ageing of the rural population are threatening not only Japan’s cultural landscapes, but all cultural landscapes and their integral richness in biodiversity on a global scale. As host of the Convention on Biological Diversity (CBD) conference in 2010, the Japanese Ministry for the Environment set up the Satoyama Initiative and thus attracted worldwide attention for the degradation of what they called “social-ecological production landscapes” (SEPL). The United Nations University Institute of Advanced Studies (UNU-IAS) in Yokohama was charged with hosting the Initiative’s secretariat. The goal of the second IPSI meeting was to provide a platform for knowledge exchange on social-ecological production landscapes, for potential cooperation, and for the acquisition of funding by IPSI members such as through the GEF (Global Environment Facility), UNDP (United Nations Development Program) or UNESCO. Fifty-eight member initiatives, represented by both scientists and practitioners, joined the conference and discussed drivers of change, threats, and solution strategies to maintain or restore cultural landscapes. The meeting was chaired by Dr. Tony Simons, Director General of the World Agroforestry Centre (ICRAF), and framed by resilience thinking. Thus concepts such as adaptation and transformation were central to the three working groups that were formed. I presented our research project on Transylvania as a case study and also held the position as rapporteur for working group 1: Capturing and Promoting Resilience including Disaster Risk Management. During the working group, we discussed the development of resilience indicators which, based on both traditional and expert knowledge, are intended to support the comparison of social-ecological production systems in the future. In addition, these indices are meant to help local communities to build or maintain resilient regional production landscapes, or simply “social-ecological systems”. The secretariat of the Satoyama initiative is currently preparing a report on the relevance of maintaining social-ecological production systems that will be prominently promoted at the upcoming Rio+20 conference. Besides, the implementation of so called ‘action points’ that were adopted in Nairobi will be tackled. Among many others, the conference participants wish to (a) develop both a conceptual framework and ‘toolkit’ to compare and strengthen social-ecological production systems; (b) mainstream the goals of IPSI into other policy instruments such as National Biodiversity Strategies and Action Plans (NBSAP); (c) stipulate multi-stakeholder dialogues on all policy levels around the globe; and (d) foster strategic cooperation with other science-policy platforms such as the IHDP (International Human Dimensions Program on Global Environmental Change) or IPBES (Intergovernmental Platform on Biodiversity and Ecosystem Services). The roadmap sounds ambitious, and we’ll need to wait and see whether and to what extent IPSI manages to meet its goals. It’s definitely worth observing and, if possible, also actively supporting the activities of the Satoyama Initiative. A next step in this direction could be to attend IPSI-3 in Hyderabad (India) in October 2012. For more information about the initiative and results of IPSI-2, please visit its website at http://satoyama-initiative.org/en.